I read this article and found it very interesting, thought it might be something for you. 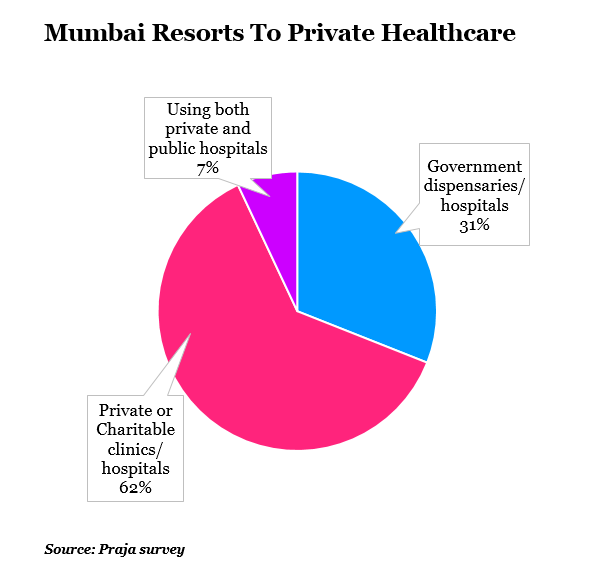 The article is called Mumbai Resorts To Private Healthcare To Fight Deadly Diseases and is located at https://archive.indiaspend.com/sectors/mumbai-resorts-to-private-healthcare-to-fight-deadly-diseases-39579. One of India’s biggest challenges is delivering affordable healthcare to its millions, particularly the poor. Many studies and surveys show how a single illness can swing the financial fortunes of a poor household. It gets worse and more frustrating when the diseases are more like epidemics and the system is unable to respond effectively. Even in cities like Mumbai. For instance, deaths arising from dengue (an infectious tropical disease transmitted by mosquitoes) tuberculosis (TB) and cholera in Mumbai continue to rise despite all efforts. Most are developing world diseases. 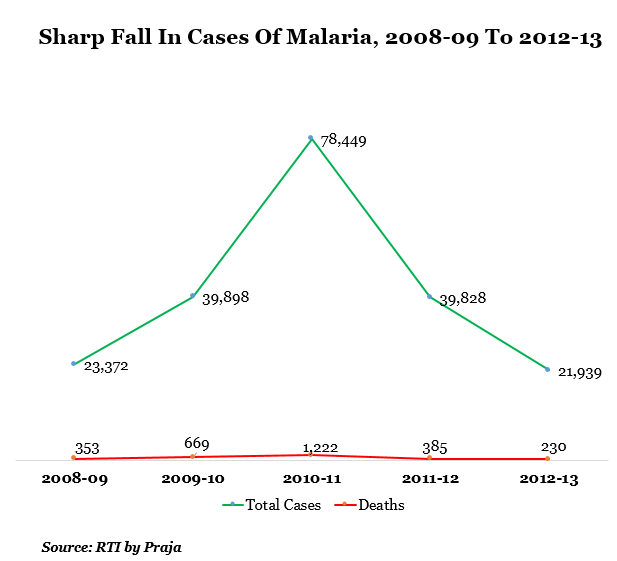 The only good news is that cases of malaria seem to be coming down. Needless to add, the solution to prevention of many of these diseases might lie outside the healthcare domain, for instance, in sanitation. Moreover, it’s evident that more and more patients, including the poor, trust private healthcare to cure them rather than state-owned facilities. A survey conducted by Praja, a Mumbai-based NGO, shows that the poor spent a considerable amount of their income on healthcare, mostly in private health facilities. Let us now look at 5-year data for the cases of malaria, TB, cholera and dengue based on data from the hospitals run by Brihanmumbai Municipal Corporation (BMC) compiled by Praja through a Right to Information (RTI) application filed with the municipal body. Total cases have declined by 6.1% from 2008-09 to 2012-13. The number of deaths has come down from 353 in 2008-09 to 230 in 2012-13, a reduction of 34%. The highest number of cases of malaria was reported in Matunga area in north-central Mumbai with 846 per 1,000 households in 2012-13. 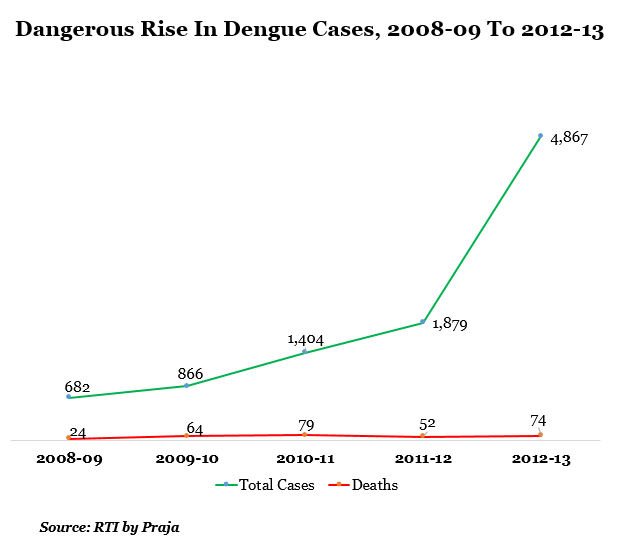 The number of dengue cases has gone up 6 times from 2008-09 to 2012-13. The number of deaths due to dengue has increased 2 times from 24 to 74 during the same period. The highest number of cases was reported in Andheri area in the western suburb of Mumbai with 16 per 1,000 households in 2012-13. 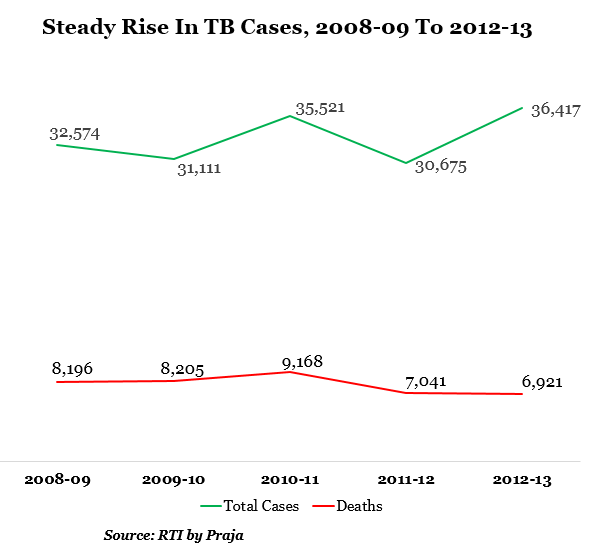 For tuberculosis, the number of cases reported increased by 11% from 32,574 in 2008-09 to 36,417 in 2012-13. But the number of deaths declined by 15% from 8,196 to 6,921 in 2012-13. 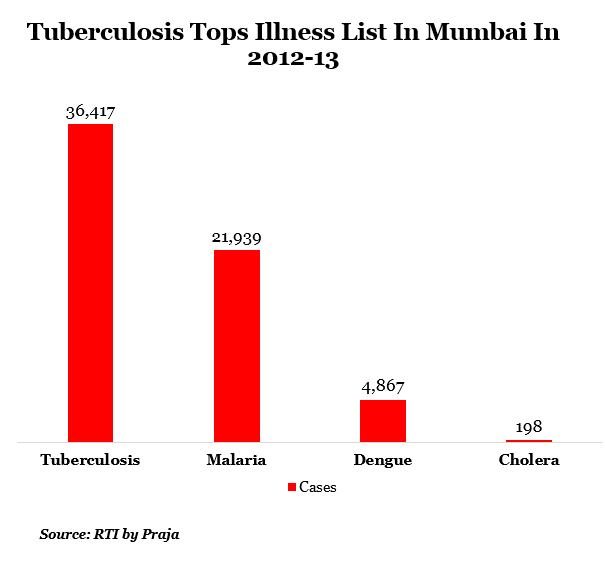 The highest number of TB cases in 2012-13 was 1,069 in Andheri followed by Kurla (central suburb) with 994. 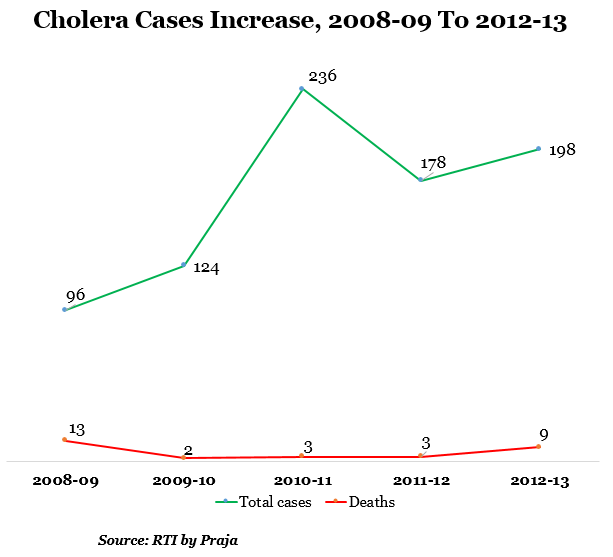 While cholera cases increased from 96 in 2008-09 to 198 in 2012-13, deaths due to cholera has come down from 13 to 9 during the same time period. 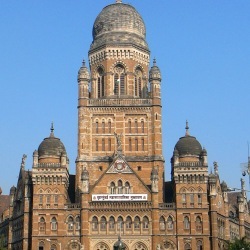 The capital expenditure on health has been increased by BMC from Rs 510 crore in 2011-12 to Rs 655 crore for 2012-13. BMC has also proposed to enhance the capacity of 16 peripheral hospitals. The total number of beds in BMC-run hospitals currently is 11,625, and the plan is to add 1,047 beds over 3 years. A survey by Praja found that only 31% of Mumbai’s residents visit any kind of municipal hospital/health facility. And a majority of the people (62%) preferred using private hospitals. The Praja survey, conducted in 2012, covered 24,694 citizens from 227 wards across the city. 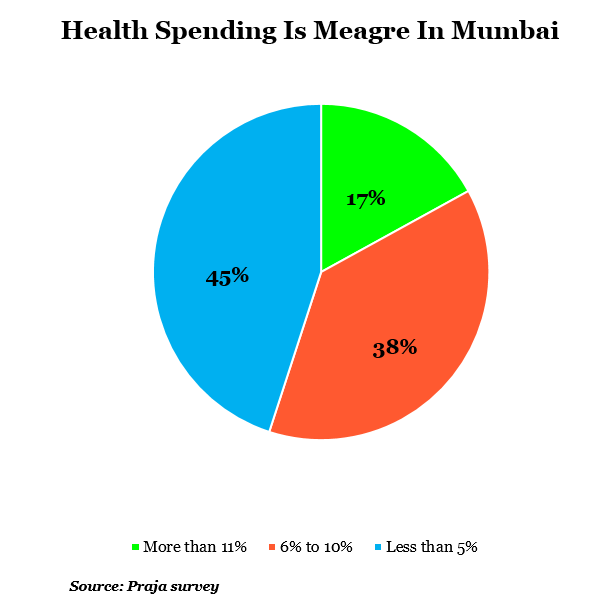 The Praja survey also found that the average spending on health was only 7.1% of the total annual income in Mumbai. Around 45% of the citizens spend less that 5% of their annual income on health followed by 38% people who spend between 6% and 10% of their income on health. While BMC has managed to curb the spread of diseases like malaria, there is a need to step up efforts to check the spread of dengue, TB and cholera. The efforts should not only be in improving health facilities but also related services like raising awareness among citizens and improving services like water supply, especially to curb the spread of cholera. Editor’s Note: IndiaSpend usually sources data first-hand through RTIs though we make occasional exceptions, this report being one of them, having collaborated with Praja.